Sheffield United striker Billy Sharp has challenged his Sheffield United team-mates to learn from their mistakes. Billy Sharp has challenged his Sheffield United team-mates to learn from their mistakes in time for the visit of Middlesbrough tomorrow night. Chris Wilder's side were 3-0 up at Aston Villa on last time out, but left with just a point after conceding three goals in 12 minutes. The veteran striker has called on his side to quickly move on and make sure they put in a perfect display against Boro. “We could have gone top of the league at Villa but it was not meant to be," said Sharp. “We have to learn from this and respond by winning the next two home games. “If we do that, we look back and see it as a good week with a useful point against Villa. “We have a lot of good players and we are a good team and we perform to a high standard,” he said. Tony Pulis will be hoping his Middlesbrough side can replicate their first-half performance against Leeds United last Saturday. Boro had three points cruelly snatched away from them by second-placed Leeds, following Kalvin Phillips’ late equaliser in the 11th minute of stoppage-time. Fifth-placed Middlesbrough have the opportunity to close the gap on the teams above them when they face the Blades at Bramall Lane. Even so, the home side have won their last four home games in the league and have the chance to leapfrog Leeds into second place in the Championship. Boro have won three out of their last four games on the road and are unbeaten in their last six in the league. 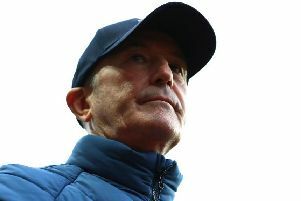 Pulis' side will remain in fifth even if they bag all three points but, with Bristol City and Derby county breathing down their necks, they can't afford to slip up. Boro will assess the fitness of midfielder Lewis Wing, who was substituted in the second half against Leeds. Stewart Downing is unlikely to start due to his ongoing contract situation.